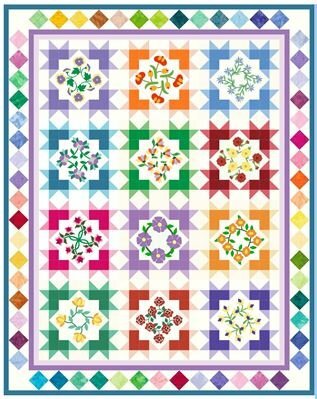 We are so excited to partner with Morning Glory Designs for the fourth year in a row to offer you fabric kits for the 2018 free Starburst Blossom Block of the Month. As we’ve done in the past, Morning Glory Designs will release one FREE block pattern and bonus block pattern each month, beginning in January 2018, and ending in January 2019 with the free border pattern. We provide the fabric kits each month at a nominal cost. 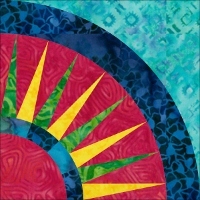 This year’s pattern combines basic piecing with fusible applique in the center of star blocks, for a fresh, inviting quilt that will be enjoyed by all. Our kits will have one White-on-White (WOW) fabric as the background for the entire quilt, and all the colors will be our gorgeous premium tonal batiks. As always, there is no registration fee, and shipping is included in the price of the kits, so the price you see is exactly what you pay each month. This is a 13-month program, with one block kit sent to you each month, and the complete border/binding kit sent in the 13th month. You MUST sign up for the Morning Glory Designs newsletter to get the free patterns each month! Sign up here: https://www.morningglorydesigns.com/ - scroll down a bit until you see the blue box that asks for your email address and name. Fill in that information and you’re good to go! DON’T DELAY – if you want the free January block pattern you must sign up in JANUARY; otherwise there will be a nominal charge for January’s pattern. For our international customers, we’ve estimated the amount of postage to send you your fabric kits each month. We hope we’ve over-estimated the amount; if that turns out to be the case we will refund the difference to you at the end of the 13-month program.